"I'm not sure I can love them any more! My supply of love is gone, my capacity to love is exhausted." Yes, there are times when it seems others will exhaust our ability to love, either because of their need being so great or because of their unwillingness to love in return. How do we go on? We need a community of love; other believers who will support and love us. 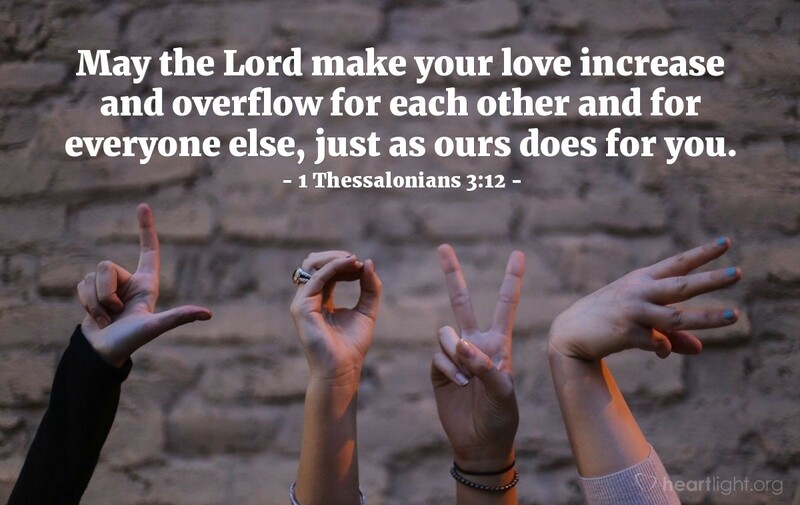 We need brothers and sisters in Christ who will pray for God to increase our capacity to love. We need to trust that in response to all of our prayers, God will pour more love into our hearts through his everflowing stream of grace, the Holy Spirit (cf. Rom. 5:5). When love is low, don't withdraw or give up. Draw near to God and draw near to his people asking for his grace to help in your time of need (Heb. 4:16). Dear Father, graciously pour your love into my heart and pour your love into the hearts of those in my family and church family. We need your help to love those around us more. In Jesus name I pray. Amen.